Arsenal will look to bounce back from their disappointing midweek defeat at Swansea when they host Everton at Emirates Stadium on Saturday's late kick-off. 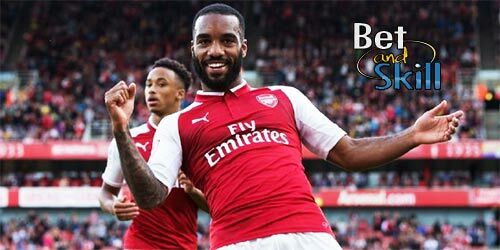 This article contains our Arsenal vs Everton betting preview with expert predictions, betting tips, starting lineups, team news, highest odds, exclusive promotions and no deposit free bets on this clash! Arsenal’s top-four bid suffered another massive setback as they crashed to a 3-1 defeat at rock-bottom Swansea last Tuesday. That defeat to Swansea means Arsenal have now managed just three wins on their travels in the Premier League this season. They have generally responded well to disappointing results on the road by winning their next game at home. Arsene Wenger's men have an excellent home record, having only lost a Premier League match to Manchester United at the Emirates in the last 12 months. As to direct encounters, the Gunners fired five past the Toffees in their first meeting this season and have won their last five home matches in all competitions against Everton. Arsene Wenger will assess club-record signing Pierre-Emerick Aubameyang. The former Dortmund's striker could replace Alexandre Lacazette up front, finding his former team-mate Henrikh Mkhitaryan once again. Mesut Ozil will play as number ten while Aaron Ramse, Mohamed Elneny and Granit Xhaka should anchor the midfield as Jack Wilshere could be rested. Changes are unlikely in defence, with Nacho Monreal perhaps an option to move to the centre, which would allow either Ainsley Maitland-Niles or Sead Kolasinac to start at left-back. Santi Cazorla and Danny Welbeck remain out through injury. Everton, who were winless in seven ahead of Wednesday's fixture, overcame Leicester at home in midweek, courtesy of a Theo Walcott's brace. It was also their first victory against a team currently above them in the table this season. Anyway, their away form remain very poor. The Toffees have recorded just one league win on the road this season. They suffered a heavy defeat at the hands of Tottenham in their most recent away game. Everton's attack hasn't been among the league's best this season. The Merseysiders have netted just 28 goals, compared to 46 for Arsenal. Furthermore, new signing Tosun has yet to flash the talent that led to his big move from Besiktas in January. Seamus Coleman returned from a long injury lay-off and could be rested. In that case, Jonjoe Kenny will play as right wing-back, with Cuco Martina on the other flank in a 3-4-2-1 starting system. New signing Eliaquim Mangala should join Mason Holgate and Michael Keane in the three man backline, with Ashley Williams providing a further option. Wayne Rooney would seem the most likely to drop out, with Theo Walcott and Gylfi Sigurdsson expected to play as offensive midfielders behind the lone striker Oumar Niasse. Leighton Baines, Ramiro Funes Mori and James McCarthy remain sidelined. Looking for the best odds on the Arsenal vs Everton match winner market? We have found them for you! Click on the 'Bet' button to take advantage of the best price! The following are 4 recommended bets selected by BetAndSkill's football tipsters. Feel free to bet on singles or build a special accumulator by combining all or many tips via a "request a bet" feature. Learn here how to request your own odds. Wanna read more betting previews on all the Premier League matches? Please visit our Premier League predictions page. Coral offer 40/1 a yellow card to be shown in Arsenal vs Everton + £5 free bet! "Arsenal vs Everton predictions, betting tips, lineups and free bets (Premier League - 3.2.2018)"